Fermium is named for the physicist Enrico Fermi. Fermium is the heaviest element that may be made from neutron bombardment of lighter elements. The element is one of those discovered in the products from the first hydrogen bomb test at Eniwetok Atoll, the Marshall Islands in 1952. For security reasons, the discovery was not announced until 1955. The discovery is credited to Albert Ghiorso's group at the University of California. The discovered isotope was Fm-255. which has a half-life 20.07 hours. 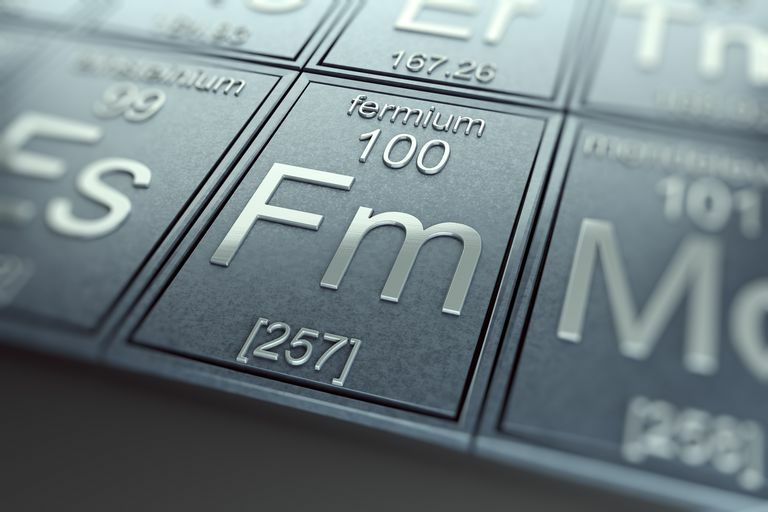 The most stable isotope that has been produced is Fm-257, with a half-life of 100.5 days. Fermium is a synthetic transuranium element. It belongs to the actinide element group. Although samples of fermium metal have not been produced for study, it is possible to make a fermium and ytterbium alloy. The resulting metal is shiny and silver-colored. The usual oxidation state of fermium is Fm2+, although the Fm3+ oxidation state also occurs. The most common fermium compound is fermium chloride, FmCl2. Fermium does not exist naturally in the Earth's crust. However, its natural production was once seen from the decay of a sample of einsteinium. At present, there are no practical uses of this element. Name Origin: Named in honor of the scientist Enrico Fermi.